You too, can build a beautiful waterfall just like this, with one of our pondless waterfalls kits! Our kits have everything you need, simply add rocks, gravel and water! We will gladly help you determine how much rock & gravel you will need to complete your project. The disappearing pondless waterfall systems we offer are customized waterfall kits we can help you put together or we have available Easy Pro pondless waterfall kits that are loaded with high quality pond construction supplies and were constructed with the professional pond installer in mind. We have made it so simple to build waterfalls, that DO IT YOURSELF waterfall installers are becoming professional builders daily. Believe it or not, that’s no joke; It’s all about the waterfall kit! These disappearing pondless waterfall kits were assembled BY professional waterfall builders, FOR the professional builder! No running to the hardware store to pick up more supplies during your build! 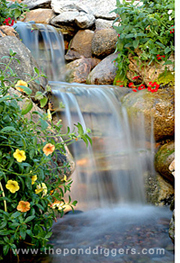 The awesome thing here it is, if you want to know how to build a backyard (or front yard) waterfall, these kits have taken the guesswork out of the construction process and once installed, the waterscape is virtually MAINTENANCE FREE! Our Pond Digger Preferred waterfall kits provide all the equipment you need to build a custom waterfall that disappears into a pondless basin. The Pond Digger Preferred waterfall kits provide a tremendous amount of flexibility in your waterfall design and the waterfall spillway is a dream to install because there is no need to seal the liner to the waterfall spillway! Our waterfall construction crew, The Pond Digger Inc., installs literally dozens of these waterfall kits each season! Easy installation! American Made! High Quality construction components! All this combined with a seriously reliable stainless steel, energy efficient waterfall pump, you are set for long term success! The price range of these waterfall kits jumps quite a bit over our other kits offered, but remember what The Pond Digger Inc installs regularly! We will gladly help you with your design to accommodate custom waterfall designs and help you determine how much rock & gravel you will need to complete your special project. Aquafalls Waterfall Spillway – Lifetime Warranty! Pump Vault – Lifetime Warranty! Stainless Steel Pond Pump – Two Year Warranty! 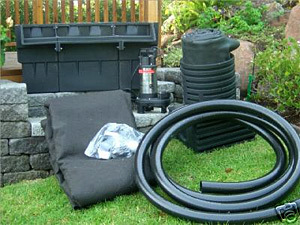 45 mil EPDM Pond Liner – 20 year warranty!